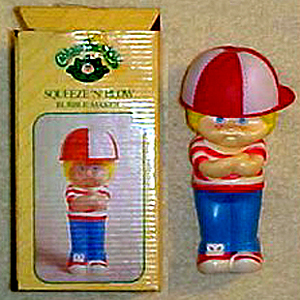 The Cabbage Patch Squeeze 'n' Blow bubble blower comes as a blonde boy and a dark haired girl. They can be filled with bubble solution underneath their hats. Remove the hat, squeeze the body, and a bubble wand will pop up out of its head. Blow and you have bubbles.